Off the tree and into the kitchen! After a long year with it's ups and downs, I had a big moment of up. 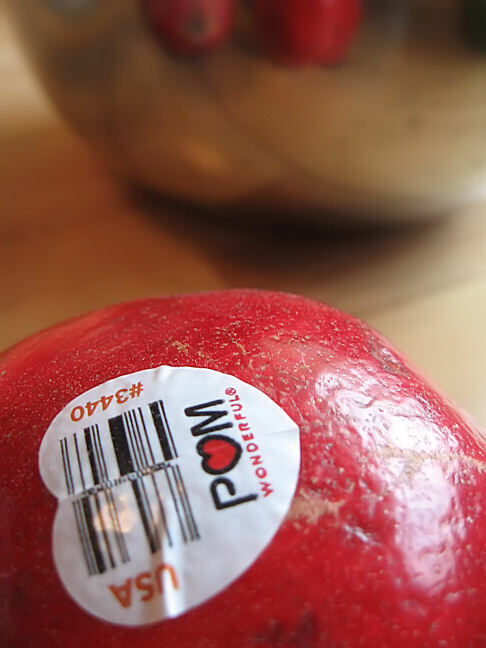 I was one of 100 bloggers around the United States selected by P♥M Wonderful of California to compete in a pomegranate-themed dinner extravaganza. I was to receive a "party kit" complete with two cases of fresh pomegranates and all the fixings to throw a fabulous party. Could this be real? Somebody pinch me... I must be dreaming. This is the type of thing that foodies go gaga for. (Will I ever be able to use the phrase "gaga" anymore without conjuring up the image of Lady Gaga?....) Needless to say, when I came home from work after a long day of too many squealing kids, unhappy parents and no wine in the house, I was greeted at my front doorstep by three huge boxes....all with my name on it! Squealing with delight, I lugged these boxes into the house and on to my living room floor. (Lug, lug, lug) I ran to the kitchen for a pair of scissors to slice open the box. (ssssssssslice) Reaching inside, moving past all the packing peanuts I caught a glimpse of my new friends....44 glorious , red and shiny pomegranates, excitedly awaiting the touch of their new owner, me! Place all ingredients into a pan, boil and simmer until sauce is reduced to about 1 cup, this will take around 45 minutes to an hour. It will still look quite runny in the pan, but when you put into a jar and into the fridge, upon cooling your molasses will have thickened up to a syrup like consistency. P.S. You can still enter my amazing artisan cheese giveaway.... all you have to do is leave a comment about your personal love of cheese - Here is the link to the post! Cheese Giveaway! That looks absoulutely decadent. I am definitely making this apart of my Thanksgiving menu! And yes, an image of Lady Gaga wrapped in police tape popped in my head...hehe. Can not wait to see your party! `What a wonderful gift to arrive home to! Congratulations! Looking forward to see you cooking up a storm with pomegranate! I am always curious and love to see recipes with pomegranate! The molasses sounds wonderful! All the best! Ah ha....you must be doing the POM WOnderful dinner party too! I'm having mine today and yes...Pomegranate molasses is a prominent ingredient. LOL..I had to laugh when you said "44 pomegranates later..." Isn't that the truth! I thought I never was going to get through picking seeds! Then all that juicing...my kitchen looked like a the scene of a grisly murder...LOL By the way...didn't POM Wonderful send the most amazing gift packages?? Holy cow! I'm going to be doing mine in a series of posts and videos. I can't WAIT to show off the party pictures though. I am sure yours will be fantastic! Good luck!! Ooo... congratulations, you lucky lady! I wish I can have some of those. lol! haha.... I'm so jealous! Frankly, it's a great idea making molasses from those fresh pomegranates. Actually, this is my first ever came across pomegranate molasses. Thanks for sharing, Megan. Hope you're having a fabulous week ahead. Congratulations! 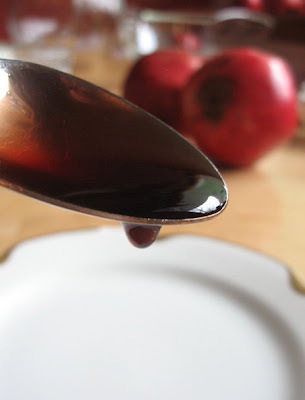 Homemade pomegranate molasses sounds really fantastic! Very cool to have made your own pomegranate molasses. I will look forward to seeing the rest of your dinner party! 44? Awesome!! This looks so good. I don't think I'd have a hard time coming up with the many, many ways to use it! 44 pomegranates?!? Why can't I live next door to you? The molasses looks delightful--I just made some for my cranberry relish!